We are excited to announce our Christmas Opening Hours! We are open our normal opening hours every day unless stated below. That means the bar is open from 12pm – 11pm and the kitchen is open from 12pm – 3pm & 5pm – 9pm (8pm on Sundays) every day. We are closing the kitchen for a private event on the evening of Friday December 7th. It will be open during the day. 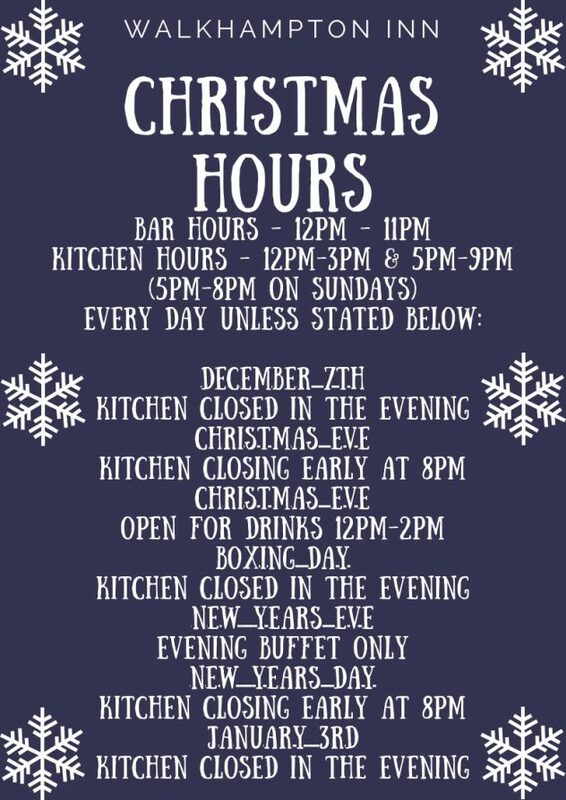 The kitchen will be closing early on Christmas Eve. We will be serving food until 8pm. We will only be open from 12pm – 2pm on Christmas Day for any of you who want to pop by to wish fellow locals a Merry Christmas! The kitchen will be closed in the evening on Boxing Day but the bar will be open as normal. On New Years Eve we will be serving a buffet for you to enjoy with your fancy dress! The theme is Pirates of the Caribbean so the food will reflect the theme. The kitchen is closing early at 8pm on New Years Day. Lastly, the kitchen will be closed on the evening of January 3rd for our Staff Party.